As mentioned in my last post, Georgene managed to convince me to try the JUDDD diet (heavily modified), starting in late April. Dr. Johnson has a fancy calculator on his website that you can use to figure the number of calories you are supposed to eat on your “down” days. You put in your age, activity level, and a desired level of calorie restriction, and it gives you a SWAG (Scientific Wild-Assed Guess, although I didn’t see any actual science behind it, just Johnson’s assertions) at a calorie level for your down day. Georgene did the calculation for me, and came up with 500 kcal. So, I adopted 500 kcal as my down-day target, at least to start with. I figured I could adjust that up or down depending on how I thought it was working for me. For the first couple of weeks, my down-day intake consisted of 2 tablespoons of MCT oil (about 200 kcal), and three 25-gram protein shakes (300 kcal). During the day, I would drink chicken bouillon, usually 2 or 3 cups. Sometimes, I would have a protein snack bar (about 160 kcal) instead of one of the shakes, so I would go over my 500 kcal goal by about 60 kcal on those days. I started dropping weight after the first down day. 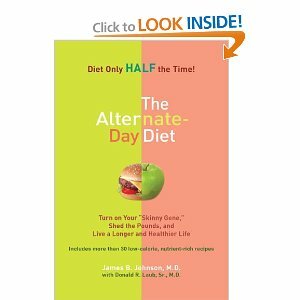 I also noticed that after four days on alternate-day partial fasting (ADPF), my appetite was generally diminished, especially on the “up” days. I also had very loose bowels on the mornings after my down days, which was more that just a nuisance. One other problem: I would often have trouble sleeping the night after a down day. I went along this way for a few weeks, after which I suspended the JUDDD diet for a week to go on the Low-Carb Cruise. As I mentioned in a prior post, I gained a little less than a pound on the cruise. During the cruise, I had no problems at all with loose bowels. I mentioned the JUDDD/ADPF diet to one of the doctors on the cruise, and told him about the problem with loose bowels. He asked me what I was eating on the down days, and I gave him the complete rundown. He suggested that when I returned home, I should check the label on that chicken bouillon. Well, guess what? Take a look at the 3rd ingredient. MSG is considered to be GRAS (generally recognized as safe) by the FDA, and there was even a double-blind study in 1993 that pretty much established that MSG was benign. However, where does MSG come from? I happened across an article in Gnolls.org that shed some additional light on the subject, namely, if there is MSG added, there are probably some other wheat proteins added along with it — and labeling laws are very loosely (if at all) enforced, so it is unsurprising that no additional wheat proteins are listed. I had already clearly established that I am sensitive to wheat, even though that never showed up on any medical exam. I’d be willing to bet money that the 1993 MSG study used pure MSG, not the stuff that was added to this chicken bouillon. I quit drinking the chicken bouillon, substituting either water or decaf coffee instead, and the loose bowel problem vanished immediately (well, except for one time that I had a “treat” containing maltitol on a down day, but that’s another known problem — if you have any food sensitivities at all, it’s likely that they will be greatly magnified if you start with a mostly empty tummy). It is certainly possible that some of the other ingredients might have been the real culprit, but I doubt that, and since elimination of the bouillon solved the problem, I’m not really interested in pursuing the matter any further. It may be that I just got more accustomed to the routine, but I also noticed that after I quit drinking the bouillon, the down days got easier. 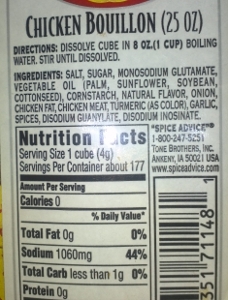 Or that might be because of the 2nd ingredient on the list, even though it was supposedly less than one gram. Then again, I recall somebody writing that the FDA considers it OK to understate carbohydrate on the nutrition label, because your government is afraid you might not be getting enough. I started using about a tablespoon of heavy whipping cream (50 kcal) in each 14-oz mug of coffee, and cut out one protein shake to keep my intake at approximately 500 kcal. I found that the decaf coffee + cream worked very well to suppress my appetite on down days. Certainly better than bouillon. Since Johnson insisted that his ADPF diet greatly increased insulin sensitivity, I started eating a little bit more carbohydrate on my up days. My weight loss abruptly stopped. Not only that, but my down days became a little more challenging, due to increased appetite. Since I suspected that the insulin sensitivity claim was probably subject to a number of confounders, I decided to go back to testing my blood sugar levels for a little while. For the first check, I asked Georgene to prepare some sweet potato with dinner. 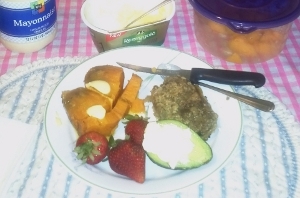 In addition to the 6-oz portion of sweet potato with a liberal dollop of Kerrygold butter, we had (grass-fed) liver, 3 strawberries, and avocado with mayo (there is a container of cantaloupe in the photo, but I decided not to eat any of that at this meal). A moderate-carb meal with “safe” starch — and delicious! At the start of the meal, my BG was 90, which is about normal for me (I try to keep it under 110). One hour later, it was 135. Three hours later, it was 121, and the next morning, it was still at 116. While that is not a “diabetic” swing, it’s a lot higher than I want my blood sugar to go, and it pretty well demonstrates that the JUDDD diet did not significantly improve my insulin sensitivity. I monitored my BG closely for a couple of days, and reined in the carbs until I saw readings under 110 for all one-hour postprandial readings. The weight started coming off again, only a little faster than before. Not entirely unexpected, since I’ve seen a number of folks in the low-carb community insist that the best weight-loss tool currently available is a glucometer. Currently my down days consist of one tablespoon of MCT oil, 2 or 3 hard-boiled eggs, with coffee and cream, and occasional low-carb “treats” like a piece of grass-fed roast, or a small can of water-packed tuna (or lately, a chocolate-pork-rind concoction Georgene came up with, which is entirely too good [Georgene here: this is Dana Carpender’s recipe – I don’t even know what made me try it, but boy is it good!]). Going by Dave Asprey‘s claim that the calories in MCT oil don’t really need to be counted during a partial fast, I suppose I’m hitting reasonably close to my target calories, except that I’m not really paying much attention to calories any more, either on my up days or my down days. I’m carefully limiting carbs — to 10 grams or less on down days, and 50 grams or less on up days. I’m also eating a bit less protein than I was before. And the weight loss is fairly steady, at least for now. And I’m feeling pretty good. For the most part, I’m even getting better sleep. This morning, I weighed in at 234, which is my lowest weight in about a decade. I plan to continue with my heavily-modified JUDDD program for a while, possibly tweaking it a bit as I go along. So far, I would say I’m pleased with the results, although it takes a bit more planning and effort to manage than I really had in mind. But the important thing still holds: I do not allow myself to get hungry. Even if that means going a bit over my 500 kcal down-day goal. This entry was posted in Diet, Health, Intermittent Fasting, Nutritional Research. Bookmark the permalink.